The fantastic array of colors found in tropical reef fishes is what draws many of us to become involved in marine aquarium keeping in the first place. Vibrant images of grand structures like the Great Barrier Reef, with its collection of sessile and motile inhabitants are what typically pique our fascination with marine creatures. But consider for a moment that the spread of colors exhibited amongst these animals is not that different from an artist’s palette. The blending of a limited number of primary colors yields new paint mixtures for the artist. Analogously, in the great oceanic food chain there is a vast source of basic pigments formed by the primary producers (photosynthetic bacteria and algae) which through feeding, metabolic processes and conversions eventually end up within the tissues of fishes, giving them their colorations. But unlike an artist’s palette, the basic pigments of the lowly primary producers have a greater purpose than for mere visual stimulation or esthetic appeal. They are vital to the nutritional content of marine food sources and to the very maintenance of fish health. In essence, they are part of a complex of nutrients found within natural oceanic foods and therefore should be a consideration for any aquarist who is dedicated to providing the best of care for their captive marine fishes. The natural pigments, distributed in the fatty-tissues of marine fishes and invertebrates, mostly begin as products synthesized within the tissues of photosynthetic bacteria, algae, and higher plants. These yellow-to-orange-red pigments, called carotenoids, of which there are over 600 hundred different chemical formulations, are typically divided into two subgroups, the carotenes, or hydrocarbon carotenoids, and the xanthophylls, or oxygenated carotenoids. The carotenoid family of pigments, while not responsible for all fish colorations, is the most widespread of pigments in marine ecosystems. Adding to the great variety of carotenoid pigments already in existence, many organisms have the physiological ability to chemically alter pigments obtained from their food sources, thus producing new color variations. Also, carotenoids deposited within the fatty-tissues of animal structures interact by overlaying base colors. An example is the Pink Flamingo, a bird that obtains its pink coloration from minute crustaceans it sifts from shallow waters with its down-turned bill. Captive flamingos fed a diet lacking in carotenoids lose their proper coloration and turn white. Another more familiar example to marine aquarists, is the Yellow Tang (Zebrasoma flavesens) which often fades and develops white patches when deprived of algae or other greenery in its diet. For this reason many prepared foods specifically designed for marine fishes contain sources of xanthophylls like algae. There are a series of physical mechanisms within the cellular and anatomical structures of fishes that enable them to reflect and to refract light and more importantly, to display colors obtained from dietary sources. The physical characteristics of fish skin are part of the key to how this is all accomplished. First, there is the epidermis. The epidermis is most often transparent and is the very thin outer layer of the skin. The epidermis can contain mucous glands, sensory cells (taste buds and alarm cells) and pigment cells. Scales, if they are present, lie below the epidermis in pockets as part of the dermis. (Fish scales are generated in the dermal layer and are not shed like those of reptiles, which are epidermal in nature). The dermis contains pigment cells of various kinds. Pigments cells in general are called chromatophores. Individual chromatophores may contain several types of pigments. Each pigment is produced or contained in separate cellular organelles called chromatosomes. The transparency of the scales and the thinness of the epidermal layer are what allow the dermal pigments of the chromatophores to show through the skin for display. Basic melanin pigments like black and brown, interestingly enough, are not obtained from dietary sources like bacteria, algae, or plants. Instead, they are protein-based pigments manufactured within pigments cells called melanophores. The almost all-black coloration of a juvenile Domino Damsel (Dascyllus trimaculatus) is one example of melanin pigmentation. The pattern of vertical bars in the Convict Surgeon (Acanthurus triostagus) and the complex arrangement of the Clown Triggerfish (Balistoides conspicillum) are others. But whether the pigment is manufactured in the cells or concentrated from a dietary source, it is the physiological mechanism of chromatophores that allow for the changing of color, pattern, and intensity in fishes. The various intracellular pigment-containing organelles can be concentrated in the cell or diffused throughout it. If they are diffused, the color is presented as more intense, and if they are concentrated the colors is muted. This cellular mechanism enables fishes to alter the intensity of color according to background, lighting conditions, and behavioral mood. 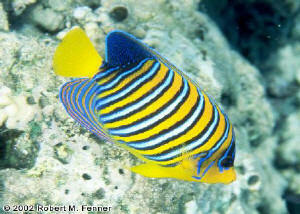 Another source of perceived color in fishes is refraction. Refracted or scattered colors are not actually the result of pigments but are created by crystalline intracellular deposits. Concentrated within cells called iridiophores, these chemicals bounce light in such a way that the reflected colors change depending on the angle of reflection. The deposition of carotenoids is not limited to the skin of fishes. Nor is the basic coloration provided by carotenoids the only biological function of the pigments. Carotenoids are fat-soluble and can be deposited in tissues throughout a fish’s body, including skin, muscle, fins, eggs, gonads, milt, and sensory organs like the eye. The layering of pigments in the skin, along with the cellular manipulation of pigments, allows fish to change color for cryptic, behavioral, or communication purposes. Many fish species in spawning condition exhibit color changes which can be attributed to nutritional triggers such as a surplus of a particular food source. Carotenoids within females are passed on to eggs and fry and the bright red or pink colors typically found in fish eggs can be a signal for fertilization or for parental care to begin. A major function of carotenoids, other than coloration, is as a provitamin, or precursor to the synthesis of vitamins. An important nutrient for most animals is vitamin A. Vitamin A cannot be synthesized by plants, but it is essential for the proper vision, growth, immunity, and reproduction of fishes. 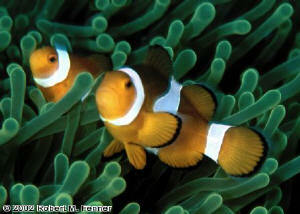 Fishes do have the ability to chemically convert some carotenes into vitamin A, often by splitting of a molecule. Another example of the nutritional value of pigments is astaxanthin. Astaxanthin is a red pigment from the xanthophyll oxygen-carrying group of carotenoids and is considered to be a powerful antioxidant... one hundred times more powerful than vitamin E. Research suggests that astaxanthin functions as a intracellular oxygen reserve and fishes and invertebrates fed on a diet containing optimal levels of astaxanthin show greater survivability rates when subjected to poor oxygen environments. Lastly, as a pigment, astaxanthin provides a degree of photo protection for reef fishes and invertebrates, which both must survive in clear waters flooded with ultra violet light. Proper deposition of such pigments in the eyes and skin of marine creatures is necessary for long-term survival and maturation. Fulfilling the nutritional requirements of marine aquarium fishes for carotenoid pigments (just like their overall nutritional requirements) in their prepared foods is inherently connected to the natural feeding methods of the fish species in question. 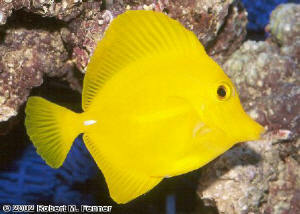 For example, there are the grazing species like damselfishes, tangs, and blennies, which browse continuously on algae. They obtain the essential carotenoid (xanthophylls) pigments from consuming green, red, and blue-green algae. Certain species of damselfishes (Stegastes and Garabaldi), keenly "farm" small patches of filamentous algae in the natural habitats, fiercely keeping away any intruders. Many species of Tang (Acanthurus and Zebrasoma) school over reefs picking at targeted filamentous algae. Blennies like the Jeweled Rockskipper (Salarius fasciatus) rasp surrounding surfaces of micro-algae growth. To achieve a proper regiment of feeding these types of fishes, different sources of food must be employed. Relying on surface algae growth in an established marine aquarium to support grazers may not be adequate. Grazers are quick to reduce excess algae growth. Remember that herbivorous material takes longer to digest, so grazers must feed almost constantly in order to remain healthy. Unfortunately, this makes herbivores prone to malnutrition if food is in short supply. But a diet of algae growth can be supplemented with sheets of dried macro-algae specifically prepared for marine aquarium fishes, or even with sheets of Nori, which is used in wrapping sushi. Feeding spirulina (blue-green algae)- based flake foods is also an excellent addition to a grazer’s diet. If brine shrimp are offered to the grazing fish and if they are accepted eagerly, then the aquarist can easily rear the brine shrimp on algae powder so the needed carotenoids will be passed on to the fish when consumed. (Gut-loading, as it is called, is a common practice in other hobbies like reptile-keeping) but natural and more direct sources of algae are always better, since fish can graze on them at will throughout the day instead of at the designated feeding times. Aquarists who utilize an algae-scrubber filter can remove the scrubber plates, the surfaces covered with the micro-algae growth, and place them directly in the main aquarium where the fish can nibble them clean. Or if a lighted sump or refugium is utilized, different types of filamentous algae can be grown and harvested for the fish. For many species of small fishes, which feed on drifting zooplankton in their natural habitat, and rely on this as their primary nutritional source, the proper prepared foods in the confines of a marine aquarium is paramount. Fishes like Anthias, Clownfishes, Dottybacks, Dartfishes, and Grammas pick at a variety of drifting particular foods like crustaceans, invertebrate and fish larvae, and planktonic eggs, to name a few. The pigments obtained from these foods begin in the primary producers and are passed along in the food chain to the zooplankton and then on to the zooplankton feeders. Fishes that employ this feeding method are accustom to some level of water movement and require several small feedings per day. Small crustaceans like mysid shrimp and brine shrimp, or color enhancing flake foods that contain carotenes are ideal for these fish species. In the end, pigmentation in tropical marine fishes is a subject more involved than the simple display of colors and patterns. The vast array of colors exhibited amongst reef fishes has a far greater purpose than for visual stimulation, cryptic coloration, or warning displays. There are intricate microbiological and physiological functions associated with the pigments deposited in the tissues of fishes. The various pigments are essential for proper growth, immunity, and reproduction. And as marine aquarists, we must appreciate the fact that a healthy level of these pigments must be maintained in the diets of our aquarium fishes. The natural food chain provides for the distribution of pigments in the wild, all the way from the bottom primary producers to the top consumers. But within the confines of our home aquariums, our diligence and intervention is required in providing these vital nutrients.